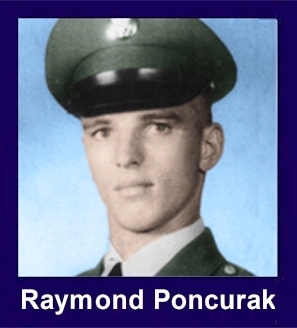 The 35th Infantry Regiment Association salutes our fallen brother, SP4 Raymond Joseph Poncurak, who died in the service of his country on August 27th, 1966 in Pleiku Province, Vietnam. The cause of death was listed as Small Arms/AW. At the time of his death Raymond was 21 years of age. He was from Miami, Florida. Raymond is honored on the Vietnam Veterans Memorial at Panel 10E, Line 51. The decorations earned by SP4 Raymond Joseph Poncurak include: the Combat Infantryman Badge, the Bronze Star with V, the Purple Heart, the National Defense Service Medal, the Vietnam Service Medal, the Vietnam Campaign Medal and the Vietnam Cross of Gallantry with Palm Unit Citation. Spec. 4 Poncuraks Bronze Star w/ V citation reads in part: "This courageous and spontaneous act of bravery inspired others of his team who moved forward to join him. Thus an opportunity was created for his team, and later the rest of the squad, to engage the enemy with accurate and deadly fire. At the same time, the immobilized unit was able to regroup and withdraw from their perilous situation. During the ensuing action, Specialist Poncurak was observed again and again displaying the same type of decisive action even when exposed to hostile fire. During one of the these actions, Specialist Poncurak was mortally wounded by enemy fire."